Our State Convention this year should be a fun one. 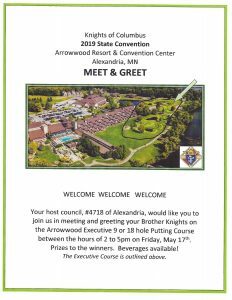 It is at Arrowwood Resort in the Alexandria area and there should be a lot of fun things to do and see in that area. The convention itself will be May 17-19th and the resort will let you come a week early or a stay a week later at the same convention rate. 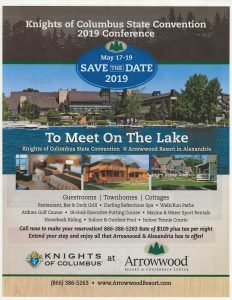 To reserve a room you must now call the hotel directly and tell them you are with the Knights of Columbus State Convention. They are no longer accepting online reservations! Click here to register and order meals. Convention Letter and Instructions Here!